Since the mid 1980's, all life has been in a process of shifting and transforming reality as we know it. The basic fabric of our dimension has been gently re-booting and morphing into a new world taking us right along with it. The only way you would not have felt this is if you had been living under a rock somewhere. It can be an amazing time filled with wonder. It can also be a time filled with many challenges that keep asking us to let go over and over, and deeper and deeper. Most every living being on this earth can feel that this is a very unique time to be alive. I knew it as a young child, and I hear from many that they also knew this to at an early age. It has been a life time of great anticipation for what the Star Elders call the best time to be on Earth. This is so because our SOULS have the greatest opportunity to evolve quickly and much further in only one life time. It is the best ride in the universe according to the Star Elders. Some of the most amazing transformational shifts have taken place in just the last couple of months. Yes . . . we are painfully aware that it has been challenging for thousands/millions of people. 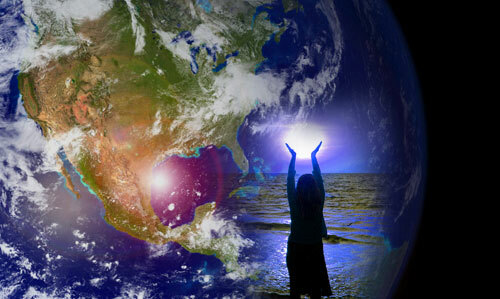 Our prayers go out to all affected by the many Earth shifts. On the lighter side of the transformation, many have felt jammed, stuck and riddled with un-diagnosable ascension symptoms. A turn of recent events has cracked open a new door which tells me that we are moving out of this phase of the transformation of our reality, and into a new accelerated phase. Key times were the time surrounding the Haiti and Chilean earthquakes. This sent us deep inside to clear out places we didn?t even know existed. Even ones that had fostered a masterful level of complete denial cannot avoid the transformational energy of this time. If they try to do so, they will feel plain nuts, loopy, out to lunch, and yes . . . Elvis has left the building! All are to awaken now. There is no going back. The energy of the Earth is rising up into a new world, and this tsunami of energy is washing through every crack and crevice in our reality. In the days leading up to the 8.8 massive Chilean earthquake, the energy all over the Earth was heavy and crushing, and many felt like they were going nuts . . . It felt like we were hanging on by our finger nails. There were many suicides and deaths. I know the whales were well aware of this shift. They disappeared in the oceans for days, and even a captive one acted out. I am sure they were feeling the pressure just as we were. But here is the good news . . . Sunday, after the big Chilean earthquake, I felt a HUGE release of energy along with a HUGE influx of LIGHT into our dimension. I could feel the Ascended Masters, angelic realms and the presence of the "I AM" energy wash across the planet. A huge old chunk of our past reality was released during those massive earthquakes. Because of this, more LIGHT could now flow into our newly birthing reality. This is yet another step in our ascension! I feel that, by mid-March, we are all going to be able to anchor a lighter state of being within. We do not know what the next phase of ascension will hold for us. But I do know that the only still point will be our connection and commitment to God, higher power, Spirit and the "I AM" within each of us. No matter how unreal this world might become, no matter how much we are called to let go, to totally surrender, this connection is the only place that will always stay constant. It will be the place where we will be able to keep our sanity while we transform our body, mind and spirit through this most amazing time. The more the masses understand this stillness inside, the easier the shift will be for all of us. We are all connected. So how this transformation plays out is up to us and our collective consciousness. Let's say this again. You are NOT victims of this transformation . . . you are the DIRECTORS! It is up to ALL of US as to how this all plays out. Empaths feel what the INCA MASTERS call Kausay Pacha (cowz-eye pah-chah) . . . a world of living energy. Sensitive ones are known as QAWAQ (cow-wak) or seers of living energy. Empaths feel Taripaypacha (tah-ree-pie-pah-cha) which means we encounter the entire universe. It is also a word that refers to a new golden era. It is known as the age of meeting ourselves again, and heralds coming the together again of all people, and the recreation of a new and better world. Are YOU a part of this emerging world?